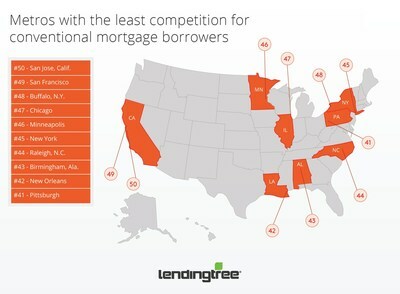 CHARLOTTE, N.C., May 31, 2018 /PRNewswire/ -- LendingTree®, the nation's leading online loan marketplace, today released its study on where homebuyers see the most mortgage lender competition. Mortgage rates are rising, recently reaching the highest levels in seven years. One of the most effective ways borrowers can adjust to rising rates is by shopping around to get the best deal possible. LendingTree tracks the savings available each week in the Mortgage Rate Competition Index, and thus far, the potential savings through comparison shopping in 2018 is an average of $28,000 based on a $300,000 loan, almost 10 percent of the loan amount. The mortgage market varies across the country, and lenders are active in different regions at different intensities. If more lenders are originating loans in a specific area, there could be more opportunities for borrowers to save by shopping around. LendingTree analysts ranked the top 50 metros by the Herfindahl-Hirschman Index (HHI), which uses a formula to calculate how competitive a market is. This is based on the recently released Home Mortgage Disclosure Act (HMDA) data, which represents over 7.3 million mortgages originated in 2017. HHI creates a score that ranges from close to zero to 10,000, with a lower number indicating less market concentration and thus greater competition among lenders, which could mean more opportunities for consumers to find lower rates by shopping around. The ranking also includes the market share of the top 10 lenders in the metro area for an alternative measure of market concentration and includes conventional, FHA and VA loans. All metro areas show a healthy level of competition, with the highest HHI at 521 across the three loan types. The Department of Justice considers a market moderately concentrated when the HHI is above 1,500, so values below this are viewed favorably. Some of the more expensive real estate markets have the least competition among lenders for conventional loans. San Jose, San Francisco and New York are all in the bottom 10 of the ranking. Market share for the top 10 lenders is close to or above 50 percent in these cities. The most competitive markets were Providence, R.I., Boston and Hartford, Conn., with top 10 market share under 40 percent. Markets that are less competitive for conventional loans are more competitive for FHA loans. San Jose, San Francisco and New York are examples again. This could indicate that lenders are unable to compete in the conventional market concentrate on FHA loans in these cities. FHA markets are on average more competitive than conventional, but VA markets are less competitive than conventional. The competition in mortgage markets means there are opportunities for borrowers to save by shopping around. "With rising interest rates, it is typical to see a decline in mortgage originations as refinance volume falls," said Tendayi Kapfidze, Chief Economist at LendingTree. "In areas where there are more lenders competing for in-market borrowers, they may have to make more enticing offers to borrowers if they want to win market share and cover their fixed business costs. This means borrowers stand to benefit by comparison shopping, a strategy that could help to minimize the impact of rising interest rates." 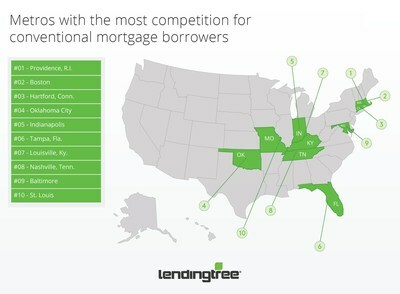 To view the full report, visit: www.lendingtree.com/home/mortgage/where-homebuyers-see-mortgage-competition/.